This review of the Little Pim Discovery Set is part of the Second Annual Natural Parents Network Holiday Gift Guide hosted by Natural Parents Network! To make browsing easier, we've split the Gift Guide into sections with products that are Perfect for Kids and Perfect for Families. And you can find all 6 Rafflecopter widgets there, too, to make entering all the giveaways easy. Without further ado, here is my review — thank you for reading and entering! 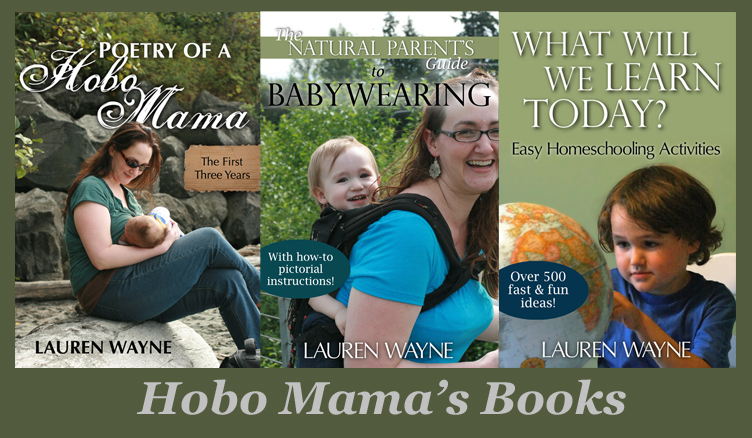 This is a joint review and giveaway of the Discovery Set from Little Pim between Natural Parents Network and Hobo Mama. 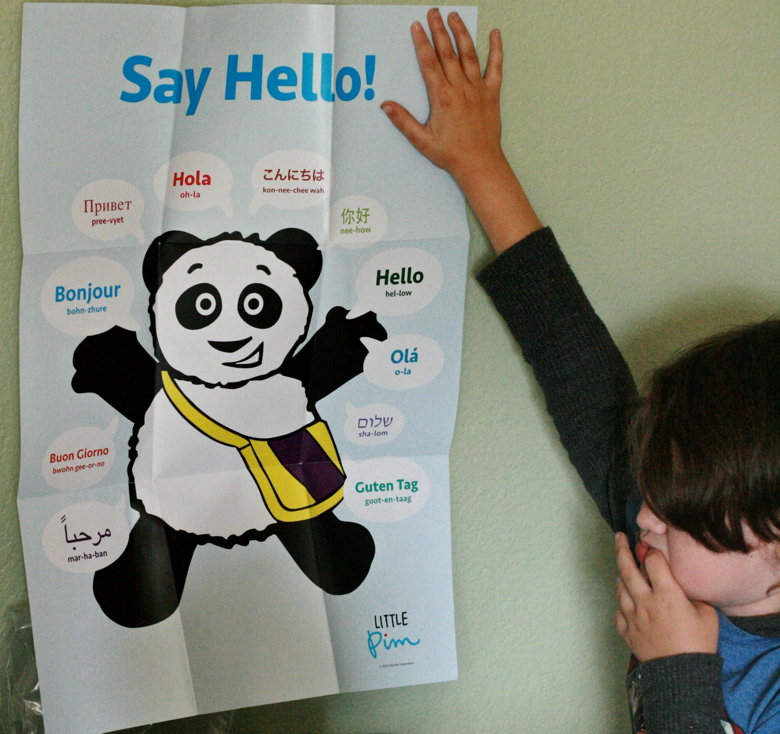 The Discovery Set that's part of the giveaway contains 3 DVDs featuring over 180 basic words in the winner's choice of language (Spanish, Chinese, French, English/ESL, German, Italian, Arabic, Portuguese), a panda plush toy, and a Little Pim poster. My kids love Little Pim, particularly my two-year-old, Alrik. 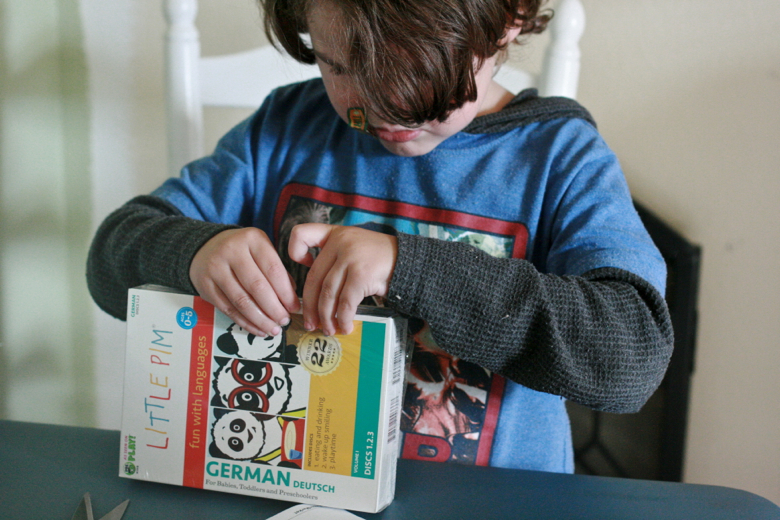 I'm always on the lookout for quality foreign language resources for kids, because I'm trying (not that successfully) to raise my kids to understand German as well as English. Since I'm non-native myself in German and don't live anywhere near German-speaking countries, it makes it a bit of a challenge, and I can always use backup. Add to that that German isn't the most popular language to learn in the U.S. and it's hard to find children's learning resources that aren't "1,001 Words in German Picture Book" over and over again. So…I was excited when I found Little Pim. They title their system the "Entertainment Immersion Method," and I like that perspective. They've based their DVDs on proven methods of language acquisition, which I've confirmed through my own research and experience. For instance, this is complete language immersion. There are no English words spoken or written throughout the German DVD — it's all in German. But: It doesn't leave anyone lost, even if a viewer is unfamiliar with German (or whatever language it is you're learning). That's because there are images and context clues, and the vocabulary repeats at an interval to reinforce learning. You don't need to be told "This is the German word for 'tree.'" You can see that the item is a tree, so your mind doesn't have to make that multi-step translational leap. Instead of learning it piecemeal: "item with branches and leaves = tree = der Baum," you learn it the way you learned your native language in the first place: "item with branches and leaves = der Baum." 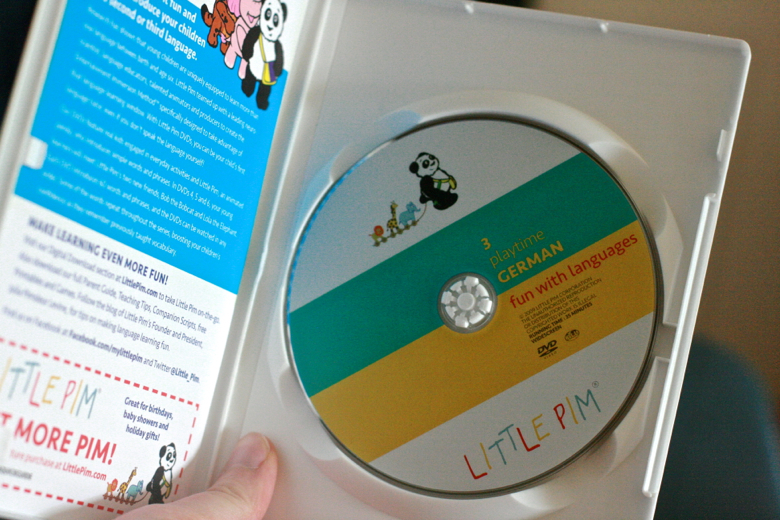 The narrator is an engaging cartoon panda named Little Pim, who guides the kids through the DVD, along with his animal cartoon friends. He could be cloying with his high-pitched voice but somehow falls on the charming side. I've heard criticism that it would be better if there were lip movements to match the vocabulary, because children learn from seeing as well as hearing a language spoken. I'm going to guess that this has a lot to do with Little Pim saving on production costs and making sure these videos are all fully translatable from one language to another by simply changing the narration. I compensate for this by saying the words aloud after Little Pim says them so my children can hear and see a human saying them. In my view, it's best to watch educational DVDs like this along with your children in any case. Little animated scenes are interspersed with live-action tableaus of children and parents setting the spoken vocabulary to action. For instance, in Playtime, children paint large shapes of different colors on an easel, giving Little Pim the opportunity to point out the words for those colors and shapes. 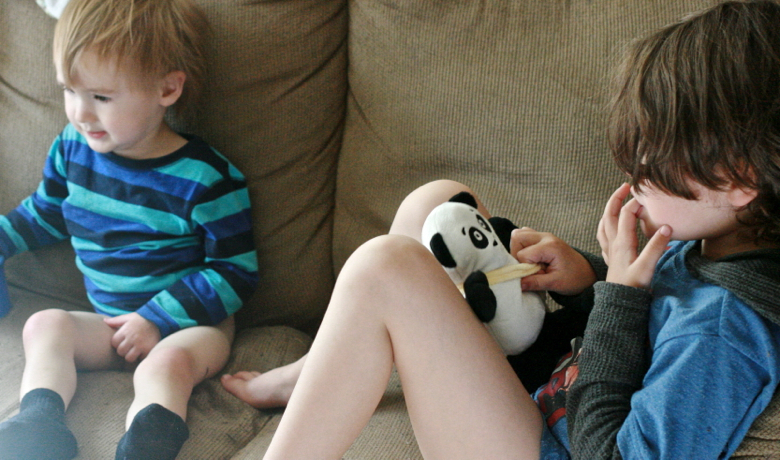 My boys have found the DVDs are best viewed without pants. The suggested age range is up to age 6, and I agree that it's geared toward younger, preschool or toddler viewers. As the website says, you only need 500 words to be considered "conversational" in a language. The Discovery Set's three DVDs will introduce about 180 words and phrases, providing the essential building blocks for language learning, particularly if you follow up with other resources and further language exposure. 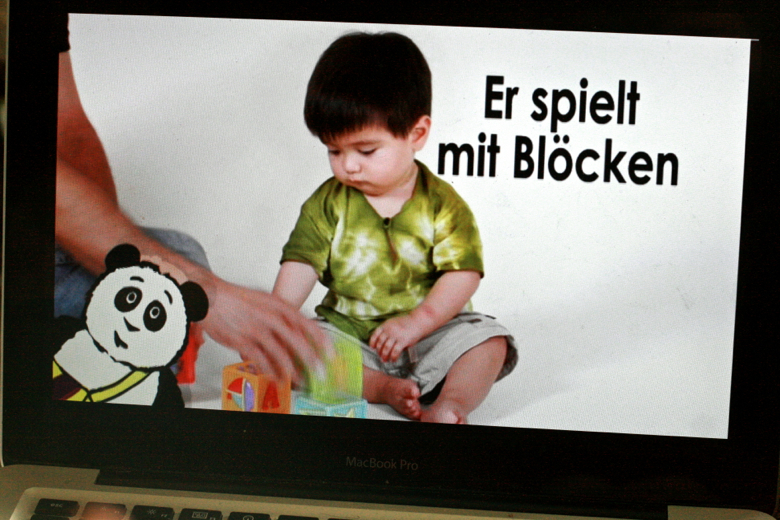 It's important to remember that no DVD — not even a full DVD collection — is going to make a child bilingual on its own. And this is definitely a very beginning resource. But these DVDs can certainly give basic vocabulary to interested children and be successfully incorporated into a language-learning plan for more serious students and families. I would love to see some intermediate and advanced resources in the future as well — perhaps a set geared at older children in the same sort of engaging style (rather than the drill-drill-homework style that can turn off language learners of any age!). 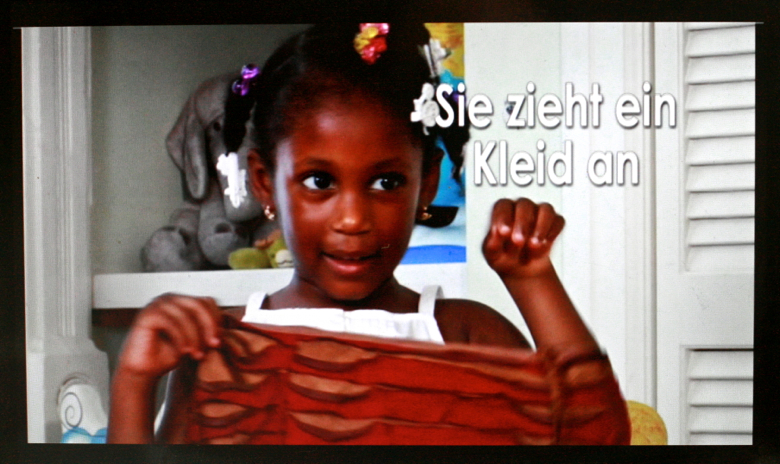 Other highlights of the series: The pronunciation is native, so children are not learning English-flavored German. It's not just vocabulary parroting — the grammar presented can be quite complex (which I think is a good thing; see caption below). Particularly for German (but common in many languages), it's very important to include the genders of nouns, and the DVDs give integrated information about how words are used both separately and in context. She puts on a dress while the voiceover and captions describe the action. how to use a gender pronoun, how to conjugate a verb, where to place a separable prefix, what article to use for the word "Kleid" in the accusative, what words to capitalize when writing such a sentence, and how to pronounce the whole lot — phew! Imagine trying to explain that to a preschooler — but then imagine the ease of just letting them hear and see it, repeatedly. I love that the children are a very diverse bunch! I also appreciate the wide selection of languages they already have available (Spanish, Chinese, French, English/ESL, German, Italian, Arabic, Portuguese, Russian, Japanese, and Hebrew) and trust they'll continue adding to the resources in each, and perhaps adding new languages over time. 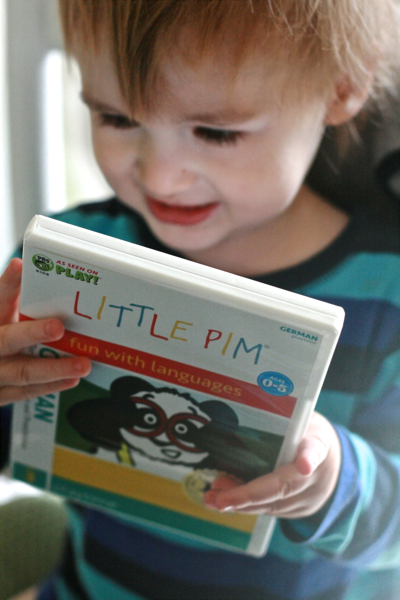 So if you or your young kids are interested in taking the first steps in learning a new language, or reinforcing one you're already learning as a family, I'd recommend checking out Little Pim! You can purchase your own Discovery Set for $34.99 for the digital download or $59.99 for the DVD set. The Discovery Set includes Volumes 1-3 (Eating and Drinking; Wake Up Smiling; Playtime), a plush Little Pim panda, and a poster, and is available in Spanish, Chinese, French, English (ESL), German, Italian, Arabic, and Portuguese. 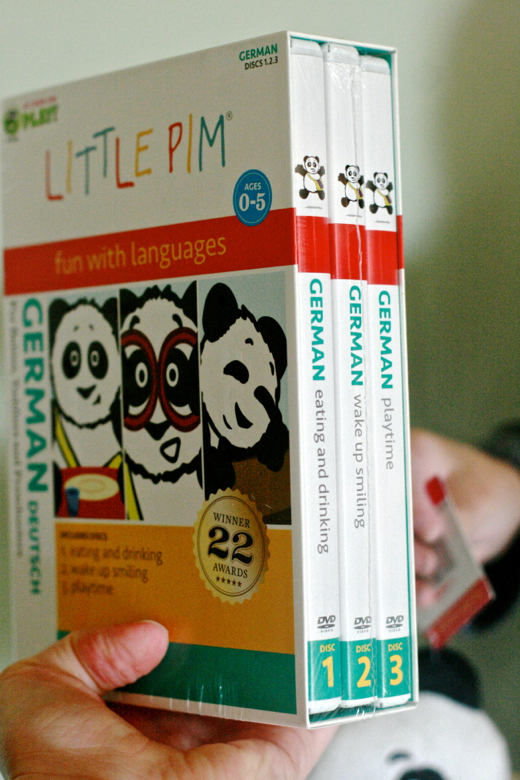 Besides these languages, Little Pim offers resources in Russian, Japanese, and Hebrew. You can buy DVDs or digital downloads of titles individually or in sets, up to full Immersion Sets (all DVDs) and Complete Sets (all DVDs plus the other resources) in certain languages. Highly popular languages like Spanish, Chinese, French, and ESL have a large range of resources available, from flashcards to children's books to music albums, but all the languages have at least Volumes 1-3 (on DVD or digital download) and the plushie available. For your own chance to win a Discovery Set in your choice of language (pick from Spanish, Chinese, French, English/ESL, German, Italian, Arabic, Portuguese) from Little Pim, enter in the Rafflecopter below! Or you can visit the NPN Holiday Gift Guide post to see and enter to win all of our fantastic prize packages at once! Disclosure: Complimentary products and consideration were given for review. of our sites at no additional cost to our readers.